Spring Salad with Shaved Asparagus and Lemon-Parsley Dressing is crisp, zesty, flavorful and healthy – perfect to cool your spring fever. Spring fever. Anyone have it? Plants are perking up, birds are chirping, animals are frolicking. You’re restless… perhaps irritable… and things. Why? Why, life, whyyyyy? I googled it and discovered the reason for spring fever is on account of all the serotonin that’s rip roaring through our systems because of the increased amount of sunlight the earth has bestowed upon us, as serotonin is formed by sunlight. Winter = melatonin = hibernation. Spring = serotonin = bow chicka wow wow. Sorry. I will never do that to you again. And I always make promises I can’t keep. Spring salad. Should we fan your spring fever with it? Cool it down, tell it to take a chill pill? 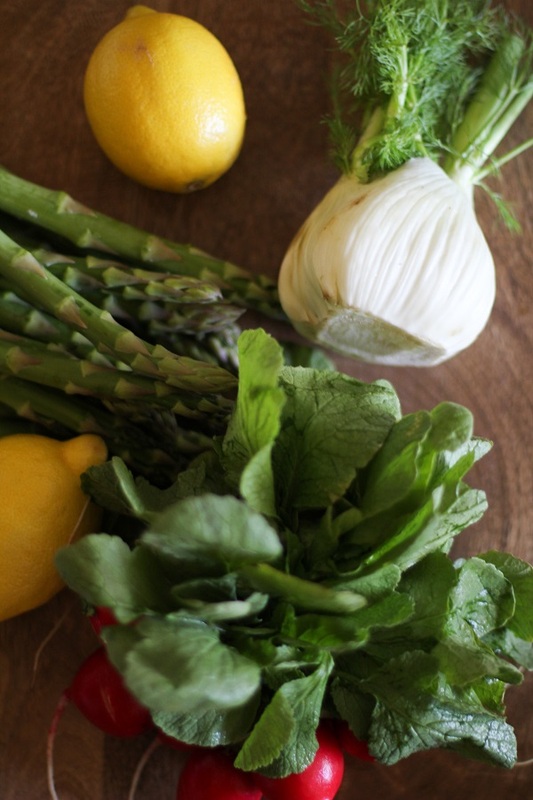 The best part about spring other than extended daylight is all the crisp spring produce. Asparagus, radishes, fennel, citrus, root vegetables, green beans, peas, greens, greens, and greens…they’re all in season and ripe for the shaving, chopping, salad-ing. Have you ever shaved an asparagus? This was my first shaved asparagus rodeo and it was a boot-stomping hootenanny. All the asparagus got shaved. My legs were jealous. Shaving asparagus does require a little time and energy output but what happens is pretty magical. All you need is a vegetable peeler or potato peeler to put asparagus in a different perspective. Simply hold one asparagus spear with one hand and use the other hand to peel it with a vegetable peeler, the same way you would a carrot. Shaving gives asparagus a makeover. Dresses it in a new outfit. Makes it so utterly edible raw. 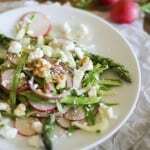 You just take your tater peeler to raw stalks of asparagi and add in thinly sliced radishes and fennel for a spring jamboree of color and flavor. This salad took me by surprise. I was originally going to make a roasted spring vegetable salad, but it was so warm and sunny this weekend (< – – – my apologies to those who are still freezing and frowny. Winter just wasn’t in our plan this year), that I decided to leave the veggies raw and whip up a zesty, herb-y lemon-parsley dressing. I was fairly certain it was going to be a blasé recipe, not meant for sharing on the blog. . .
And it was the exact opposite. The thinly sliced spring veggies with the lemon-parsley dressing, walnuts and feta cheese come together like bow chicka bow wow wow. Oops. And because I can’t possibly eat salad without gobs of avocado and some form of animal protein, I ate the salad with gobs of avocado as soon as I finished snapping photos. 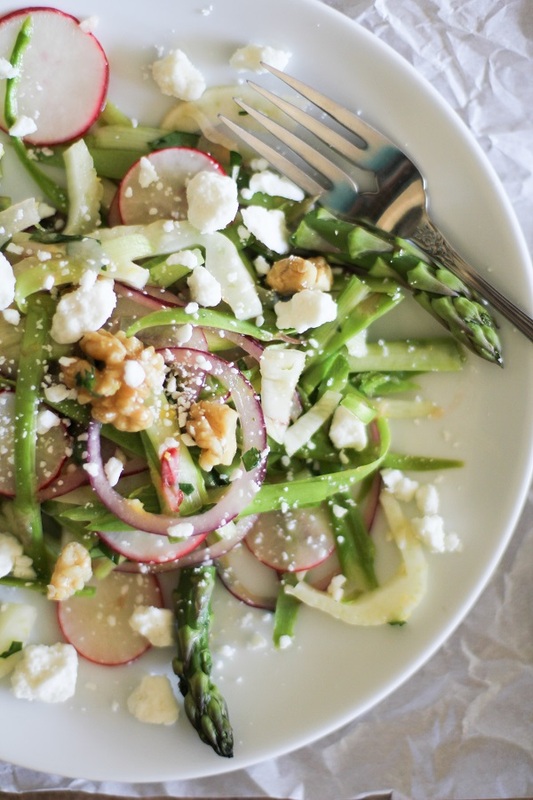 Do the Cupid Shuffle then cool your spring fever with this spring salad. Thinly slice the radishes and fennel bulb and add to the salad bowl along with the chopped walnuts and feta cheese. Pour all of the lemon-parsley dressing over the salad and toss well. If desired, serve the salad with chopped hard boiled eggs and avocado. This is beautiful girl, pinned! bahaha! Stick him on a trail 10 miles away and tell him to find his way home…that’ll help him get some of his spring fever energy out 😉 Good luck, sister! This salad is beautiful!! Totally a spring must have! Thanks, love! 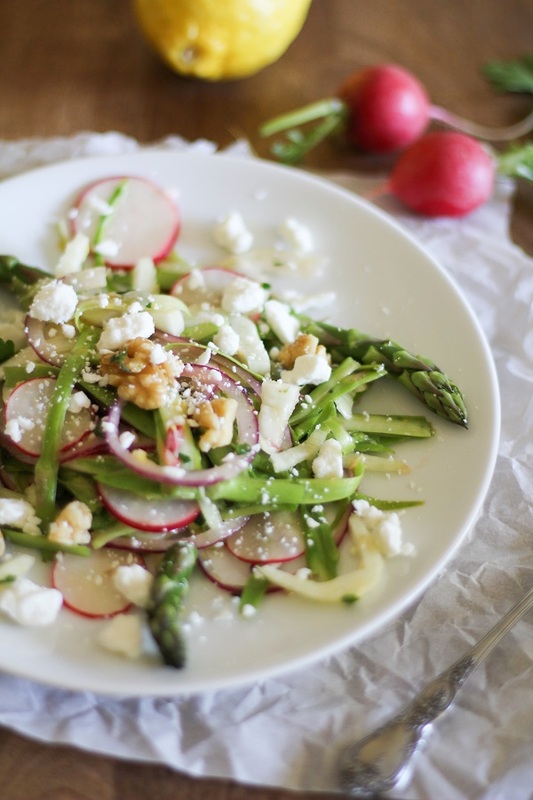 Spring salad all around! Thank you for teaching me science and for sharing this salad. I am off to shave my legs and asparagus (spring has sprung). Shaved asparagus = a way to get asparagus in even more bites = totally on board with that! I’ll let you know if I get a case of spring fever as soon as it stops snowing. Seriously. Snow. Right now. But I closed my blinds, so let’s pretend it’s sunny already. Shaved Asaparagus Salad is one of my favorite things about spring. I really love the combination you used here – radishes totally don’t get enough love, but they are so fab in a salad! Thanks, Josie! Adding radishes to salad is altogether new for me, and after making this, I’m totally sold! Gobs of avocado are always necessary. Perhaps I shall conquer my angst over radishes with this lervely salad. That dressing…I’d drink it. An avocado a day keeps the doctor away, that’s my motto. Seriously, I eat an entire avocado every day. It’s kind of ridiculous. The radishes are pretty stellar in this salad because they add a nice peppery flavor and aren’t overwhelming. Like, they don’t make you want to spit them out and wash your mouth out with Listerine 😉 Hope you try it! Looks lovely. I wanna twirl that red onion ring! In all seriousness, this salad looks amazing. For some reason, I’m dreaming of adding boiled egg and avocado to it…. This salad is RIGHT up your alley, Sarah! You’ll love it! And the hubs! Loves all around! P.S. why is it that we give our food more attention than our hygiene? Hmmmm…. This salad is beautiful. I love how springy it is. I love this salad so much Julia – totally adding it to our to-make list! Thanks, Vijay!! Let me know when you make it. Amazing how addicting and delicious fresh raw veggies can be. The lemon-parsley dressing is a real deal maker! I’ve got spring fever girl! This salad has my name written all over it. It certainly does, my dear!! We need to scarf some of this salad and then sow some plants like we’re responsible for feeding the world in order to get some of this spring fever energy out. “All the asparagus got shaved. My legs were jealous.” <–BAAAAHahahaha. You're perfect. My legs are DEFINITELY jealous of all the asparagus I’ve been shaving. And I think the.boy is kind of wishing I’d direct my shaving proclivities elsewhere, but oh well. It’s still not shorts season here, so who cares. I love how fresh this salad is!! I’m welcoming the bow chica wow wow. All this hibernation has left a few extra pounds on my thighs. I’m ready for sunlight and cycling. This salad. looks refreshing. Love! Pretty pretty pretty! 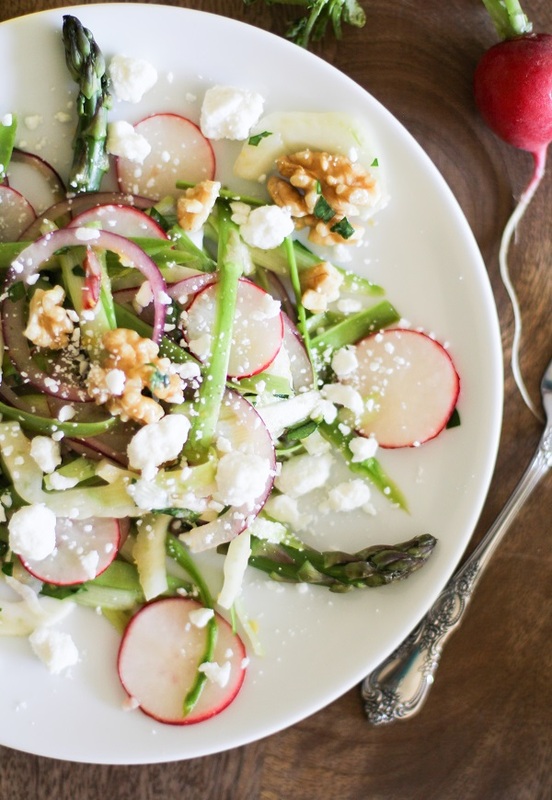 I am all about this Spring salad! Must make… like now. It’s just so pretty! I love this spring weather, give me all the serotonin haha. I’m ready for everything to wake up and get all twitter pated. Hi my family member! I want to say that this post is amazing, nice written and come with approximately all important infos. I would like to peer more posts like this .